Transforming growth factor-j3 (TGF-/3) is growth stimulatory in endothelial cells but growth inhibitory for epithelial cells, rendering it a tumor suppressor gene in epithelial-derived cancers. The TGF-/3 family of growth factors binds to two unique receptors, TGF-/3 type I and type II. Tumor cells lose their response to the growth factor and mutations in the receptors also contribute to carcinogenesis. Ligand binding to the TGF-j3 receptors causes intracellular signaling of other tumor suppressor genes, the Smad proteins. Smads help to initiate TGF-j3-mediated gene transcription. normally inhibits growth of human colonic cells, but in the process of becoming tumorigenic, these cells obtain a decreased response to the growth inhibitory actions of TGF-j3. 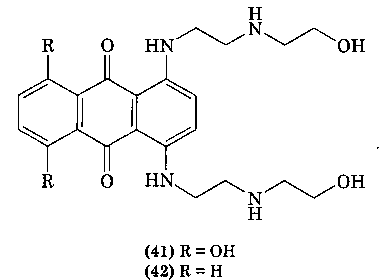 TGF-/31 also serves as an inhibitor of immune surveillance (94). TGF-/31 indirectly suppresses the function of the immune system by inhibiting the production of TNF-a and by inhibiting the expression of class II major histocompatibility complex (MHC) molecules. also promotes tumor progression by modulating processes necessary for metastasis such as degradation of the extracellular matrix, tumor cell invasion and VEGF-medi-ated angiogenesis. Figure 1.11. The APC signaling pathway. 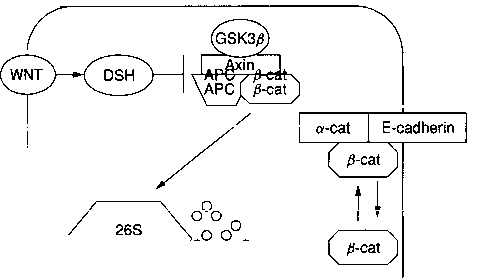 In a normal cell, APC forms a complex with axin, GSK-3/3, and p-catenin. This promotes proteosomal degradation of j3-catenin and prevents transcription of /3-catenin/Tcf4 target genes. 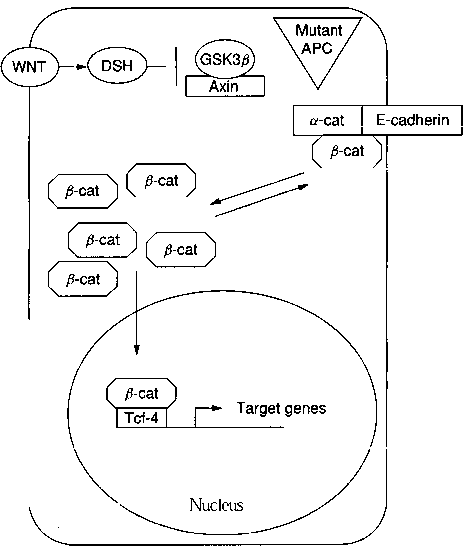 When APC is mutated, the multi-protein complex cannot form and p-catenin is not degraded. 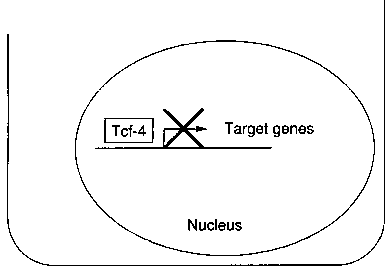 Instead, is translocated to the nucleus where it binds with Tcf4 to activate transcription of various target genes. Some of the known target genes, like c-myc and cyclin Dl, play important roles in cell proliferation. many as 25% of colon cancers have missense mutations in the kinase domain of this receptor. Amissense mutation in the kinase domain of the T/3RI has also been identified in metastatic breast cancer. It was also found that the expression of the TGF-02 receptor is suppressed in metastatic oral squamous cell carcinomas compared with the primary tumor. 4.2.6 Heritable Cancer Syndromes. 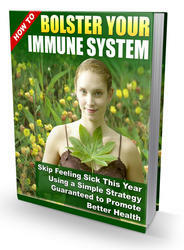 There are several known inheritable DNA repair-deficiency diseases. Four of these are autosomal recessive diseases and include Xeroderma pigmentosum (XP), ataxia telangiectasia (AT), Fanconi's anemia (FA), and Bloom's syndrome (BS). XP patients are very sensitive to light and have increased predisposition to skin cancer (approximately 1000-fold) (96). AT patients exhibit a high incidence of lymphomas, and the incidence of lymphoma development is also increased for both FA and BS patients. HNPCC arises due to a defect in mismatch repair (MMR). The incidence of HNPCC is often quoted as 1-10% of all colorectal cancers (97). It is an autosomal dominant disease and results in early onset of colorectal adenocarcinoma. Many of these tumors demonstrate microsatellite instability and are termed replication error positive (RER+). Endometrial and ovarian cancers are the second and third most common cancers in families with the HNPCC gene defect. The most common mutations in HNPCC are in the mismatch repair genes, MSH2 and MLH1 (>80%) (98).The mismatch repair system normally corrects errors of 1-5 base pairs made during replication. Therefore, defects in this system result in many errors and create microsatellite instability. A suggested model for HNPCC development starts with a mutation in the MMR genes followed by another mutation in a gene such as APC. These two events lead to cellular hyperproliferation. Next, a mutation occurs leading to the inacti-vation of the wild-type allele of the MMR gene. Because of this MMR defect, mutations in other genes involved in tumor progression, such as deleted in colon cancer (DCC), p53, and K-ras, occur. A variety of genes are responsible for the different inherited forms of GI cancers. For example, individuals with FAP, bearing germline mutations/deletions in the APC tumor suppressor gene, account for only a small fraction of colon cancers in the United States (<1%). However, the majority of sporadic colon adenomas have also been found to contain single allele alterations in APC and exhibit altered signaling of p-catenin, a protein negatively regulated by APC. Altered /3-catenin signaling is inferred from immunohistochemical studies demonstrating that j3-catenin is translocated to the nucleus in the majority of epithelial cells in adenomas, whereas jS-catenin is generally seen associated with the cell membrane in normal colonic epithelia. These data suggest that the process of adenoma development selects for alterations in APC.